Yi transforms traditional, uninspired prosthetics and orthotics into tailor-made creations for clients, taking into account the individual’s needs, desires and state of mind. The point is not to manufacture conventional, “corrective” physical aids that blend in with the status quo; instead, these innovative pieces capitalize on the diverse beauty found in disabled bodies, highlighting difference and redefining not only fashion but disability itself. Yi herself identifies as disabled, using her body structure of two digits on her hands and feet as inspiration for her fashions and footwear. She’s also chronicled her experiences as a corporeal rebel in an unforgiving medical industrial complex in the photographic series Re-claiming Me. The photos re-create a visit to the doctor’s office in her native Taiwan, quoting both the doctor (“you’re not normal!”) and her responses to his objectification (“Don’t diagnose my body and underestimate my ability before you get to know me”). I spoke with the visionary Yi to find out what Crip Couture means on an intimate level for the artist and within a larger political framework for the disability community. What is Crip Couture and what inspired it? Since 2000, before the birth of Crip Couture as a concept, I had worked on a series of wearable items. Earlier on, my work focused on exploring the social interactions that I had with others. Each wearable item—body adornment—was created [based] on specific incidents, including [hearing] screams when someone discovered my hands, having someone intentionally drop my hand in the middle of a handshake, receiving unsolicited medical advice intended to make me look “acceptable.” Gradually, I started implementing photographic self-portraits to document the narratives within the body adornments and examine the meanings of staring in social constructs. Currently, I am interested in collecting narratives and creating personalized, intimate wearable art for other women with disabilities. Crip Couture is about creating disability/crip aesthetics and culture through wearable art, [and examining] how the creation of body adornments raises questions about society’s perception of disability. How can the representation of disabled bodies in Crip Couture give voices to people with physical impairments and to analyze the complexity of meanings around bodies? At what age did you begin to identify as a ‘crip?’ How has that informed your art? I have self-identified as a disabled person for six years. I was not really exposed to Crip culture until I came back to the United States in 2009, at age 28. It felt like I had been with Crip culture for a long time, but it was only a few years ago—maybe it has to do with how it feels really like home to me! I feel that “crip” adds a layer of culture belongingness and identity to my work. Crip is a style and an aesthetic; it’s a cultural, social, and political statement. I was deeply moved by the Re-claiming Me photo series that captured an appointment at the doctor’s office. What was the motivation for that project? The motivation for Re-claiming Me came from many of my memories and interactions with medical professionals, particularly doctors. Ever since I was a child, I would run into doctors who recommended getting prosthetics or constructive surgeries, even [when] the purpose of the visit was because I had a fever or a backache from bad posture. I remembered seeing a doctor for a fever at age six. After prescribing some meds for my fever and cold, he suggested my mother take me for a prosthetic fitting. “This way, she would look like that she has five fingers, she would be able to fit in and be normal!” he said. As an honest, young child, I was not fond of the idea of “lying” to others by wearing a pair of “fake hands.” I told my mother that it would take so much time to learn how to use the fake hands when I already have my ways of doing things with my fingers. I wanted to stay genuine to who I was. The reactions from all these doctors, who I am sure each received training and education from separate institutions at different times, all pointed to the same message—your body is defective, let’s fix it for you! Such cumulative experiences made me look back at the body memories that I have had: I traced back [to] how I felt as a young child, a teen, and then a young adult who received blame for feeling vulnerable when I was asked to put my body on display for the doctors to diagnose and for the nurses and doctor residents to whisper [about] to each other. I looked at my difficulties in recognizing how ableism camouflaged itself as a gesture of “kindness” when doctors played an authoritative figure in my life. I decided to go back and “fix” these memories with the doctors. By re-creating the clinic experience, I worked on portraying the dialogues between the doctors and myself. I then imagined: If I were able to speak to all the doctors who tried to fix me in the past (or in the future), what would I wish to say to them? What (or whom) has been the biggest inspiration for your artwork? Memories, my body, textile-based materials, and other artists whose work focuses on disability, body and identity. 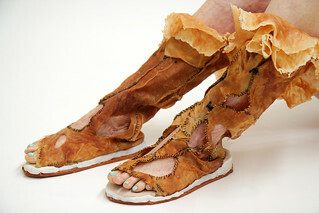 To check out more of Yi’s incredible wearable art, visit the Crip Couture website.